HISTORY OF THE KERN COUNTY WOOL GROWERS AUXILARY "THE BO-PEEPS" Since 1958, the "Bo-Peeps" have diligently served the U.S. sheep industry. We actively promote lamb and wool through our work and sponsorship at the annual "Kern County Sheepmen's Picnic", Kern County Fair Days, "Make It Yourself With Wool" competition, Farm Day in the City, 4-H Fashion Review and the Pacific Coast Junior Livestock Show. We eargerly address our industry's political concerns and perform scholarship program that promotes continued education in Agriculture. Through our work, we promote friendship and better public relations and help procure the needs of our unique and challenging industry. Our many accomplishments throughout the past 40 years have been under the leadership of the following women:1958-59 Ruby Evans1960-61 Genevieve Laxague1962-63 Jo Frances Ansolabehere1964-65 Marie E. Ansolabehere1966-67 Jeanne Puget1968-74 Marie E. Ansolabehere1975-84 Marie Jeanne Echevere1985-88 Adrienne Goyeneche1989-90 Pandora Perry1991-95 Marlene Bell1996- Patricia BernalThe "Bo-Peeps" are proud to assist the hard-working and dedicated producers who make Kern County a national leader in producing lamb and wool. These top producers tend to approximately 129,000 head of sheep that annually produce approximately 14.7 million pounds of lamb and 1.5 million pounds of wool. Our members pledge their continued assistance to the oldest association in California, The California Wool Growers Association, which was established in 1860, and to our Kern County Wool Growers Association, formed in 1930. We are pleased to share with you, this our second volume of pictorial and culinary treasures. We trust that by viewing these sheepcamp scenes and tasting many of our heirloom receipes, that you will experience and appreciate the goodness of our unique industry and the products we produce. 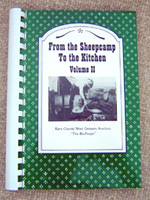 So, we hope you enjoy these recipes, which are the favorites of not only the "Bo-Peps" but also the men in the sheep camps.Patricia BernalPresidentKern Co. Wool Growers Auxillary ... The "Bo-Peeps"BASQUE SHEPHERD'S PRAYERYou, O Lord, are the Creator of these beautiful mountains.We will always Praise your Majesty!Praise the Lord, oh you shephards,Praise Him in your song.He is the Creator of the universe,He who is Almighty forever and ever!ARTZAINAREN OTOITZAMendi gainetan zoin den eder Jauna,Zure betiko haunditasuna.Kantus aipa zak gain hoita artzaina,Menderen mende nausi dagona.Mundu zabal hau zuk duzu egina,Bihotzez agur zeruko Jauna,Mendi gainetn zoin den eder Jauna!Sure betiko haunditasuna.Gora Jauna! Gora Jauna!Artzaunen artzaina, beira serutik gure mendiak,Beira kaiolar eta ardiak.Bai suri gaude artzain guziak.Gora Jauna! Gore Jauna, Gora Jauna!